Normally you might hear me say “I don’t like salmon, it tastes too fishy.” However when I went to Paris this time last year I had some salmon that was SO delicious. It’s such a healthy fish (Omega-3 fatty acids lower your risk of dying from heart disease and it has 40 g. of protein in half of a fillet.) 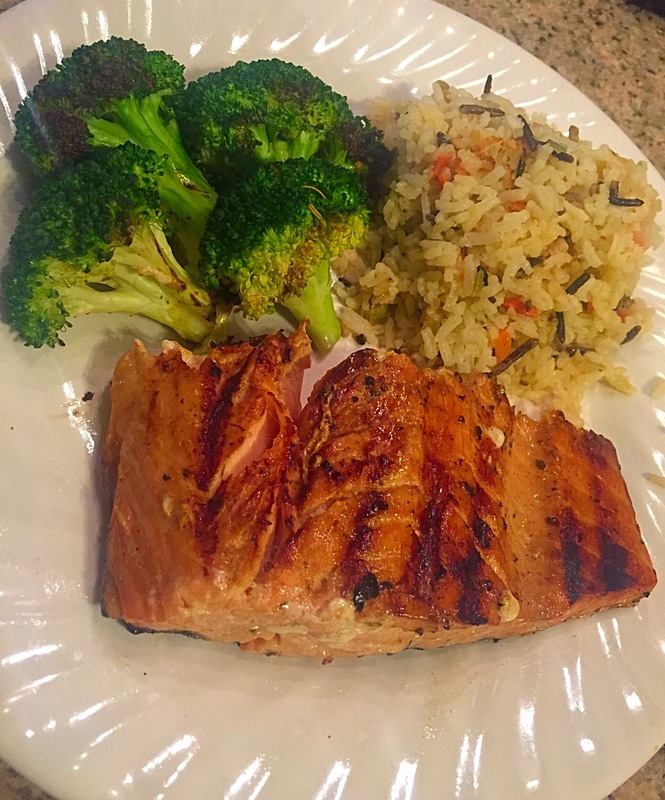 But I’ve never actually prepared salmon at home, because I always thought I didn’t like it. So I bought a piece of fresh Atlantic salmon from Trader Joe’s. My Mom suggested that I try her new electric grill, although I’ve never used one before either. I was excited to let the adventure begin! New food and a new way to prepare it. I googled “grilled salmon,” and picked the recipe with thousands of positive reviews. I whipped up the brown sugar soy sauce marinade, but I was hungry, so it only marinated for about 20 minutes, not for two hours as the recipe suggested. I also added a spice I got from the local Spice shop called “Fresh Water Fish.” It was so easy to cook it on the grill, I think I might use it to meal prep on Sunday. It was big enough to throw on a burger, a steak, fish and chicken all at the same time. I didn’t have zucchini or squash as pictured on the Grill box. The only fresh veggies I had in the fridge were broccoli and spinach. I decided the spinach would probably be a complete mess, so I went for the broccoli. 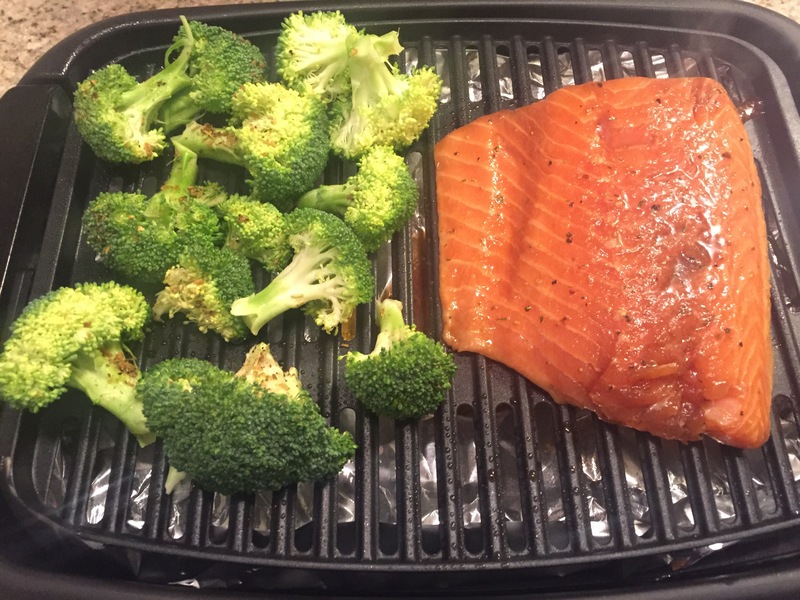 Can you grill broccoli? Who knows? We’re on adventure right? Well I did grill it, and let me tell you it was so good and crunchy. Everything was freakishly good. I can’t imagine how good the salmon would have been if it marinated for the full two hours. So before you say you don’t like something, try it fresh, try it grilled and try new seasonings. You might find you actually do like. Now my only problem is trying not to eat the other half of the salmon.